The P-51B is 190.5 KB. Larger files take longer to load. This is the P-51B listing page, here you can download the plan, article and see the main thumbnail and extra images. Flying Aces' Tom Nallen produced this nice CAD drawing of the P-51B Mustang, an export Mustang version notable for its "Malcolm" canopy that provided superior rearward vision for the pilot, important for air combat! The CAD drawing is clear with fully detailed ribs and formers. However, materials sizes and propeller diameter/pitch aren't shown, so these plans are best used by rubber scale modelers with previous experience, or access to information, to produce a suitable flying model. It has also been pointed out that the 15 1/2"wingspan exceeds the 13" maximum wingspan to be legal for "Peanut Scale" competition, "ygnve" gets credit for noticing this. Thanks to "stickman" for providing Nallen's tidy CAD drawings for this iconic WW2 fighter aircraft! 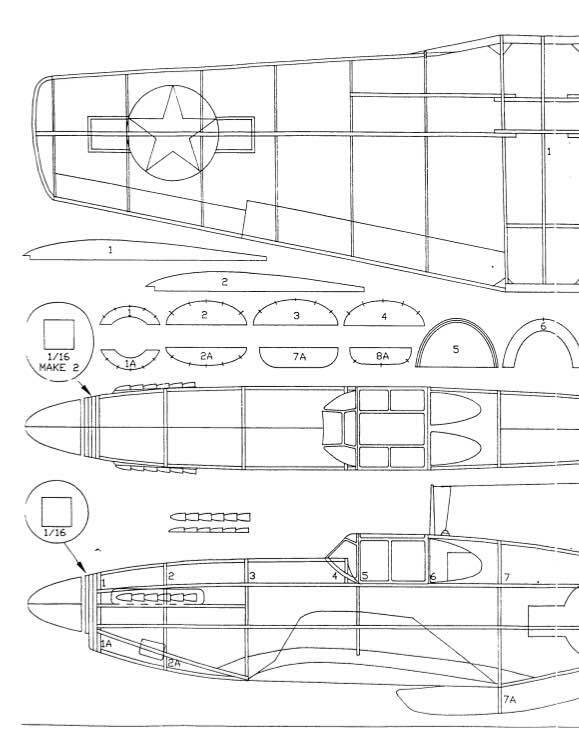 These are the details for the "P-51B" plan. If you would like to become a plan editor and help us to edit the attributes of all the plans in the website please click the "Edit Attributes" button below. Order your P-51B prints today! The P-51B plan can be printed on plain paper, tracing paper or polyester film and shipped worldwide. Scale: The original wingspan for this model is 15.5 in. / 39.4 cm. Please Change the values below to order in a different wingspan. This tool allows you to calculate the cost of printing and shipping the P-51B plans and its building article if available. If you need to resize a plan please contact us with the ID:83111 and the desired wingspan. I will calculate a price upon request, please contact me here mentioning this PlanID: 83111 and the job you wish me to do. 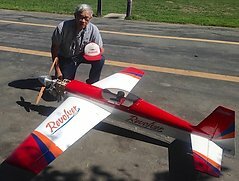 Peanut size model is defined as having either a maximum wingspan of 13” inches, or a maximum fuselage length of 9” inches. These sizes are recognised by the Federation International Aeronautique (FIA), which is the international governing body of model aeroplane competition. In the United States, as in numerous other countries that engage in model competitions, contests can be run to either National rules (Academy of Model Aeronautics/US, British Model Flying Association (BMFA)/Great Britain, for example) OR FAI rules, a clear 'either/or' choice. In the US, rubber-powered free flight competition rules were generated, and are updated on a regular basis, by the Flying Aces Club (FAC) which provides great detail on scoring, different classes, and conduct of competitions; the AMA looks to FAC, an aeromodelling Special Interest Group (SIG) to provide this governance, similar to what other specialized SIGs do in other events. Yngve's point is correct that for Class F4F (Peanut Scale), 13" is the maximum wingspan as per FAI (and FAC) rules. The original designation of this P-51B model, 15 1/2" span, as "Peanut Scale" was a posting error that has now been corrected. It is worth noting that Peanut Scale competitions, at least in the US, are almost always conducted under AMA and FAC rules; for these "National" events, FAI F4F "Peanut Scale" rules are not applicable. The key difference: the FAI "Peanut" definition calls out a maximum 10" fuselage length, the AMA/FAC rules do not. If an "International" F4F competition was ever held, then FAI F4F rules would apply to models competing at that level; this editor has never heard of such, and the F4F rules are only "Provisional", a lesser designation compared to other sanctioned FAI events. This plan is 190.5 KB and was shared by our member aeroastro on 02/04/2015 15:59 in the PDF Bitmap Wood Model Airplane Plans (1) category. It has been downloaded 228 times.